Back in October, ellagee was featured on Gloss48, the niche beauty website that brings you the best from the beauty world. I was given the opportunity to swatch the collections but then I thought I lost my copy of the photos! Found out yesterday that I was wrong, YAY! So without further adieu, I will be reviewing the 5 polishes I had, more in depth! First is Shake A Poor Sinner's Hand, from the Dr. Facilier Duo. This is a berry violet holographic polish that was opaque in 2 coats. I used a base coat of Glisten & Glow Stuck on Blu!, 2 coats of polish and finished with Glisten & Glow HK Girl Top Coat. Formula was smooth. You can see how holographic it is with the sun. Definitely a fan. I haven't really met a holo I didn't like. You can still purchase this Duo from Gloss48 here. You can purchase ellagee through her website. Prices range from $8 to $15.00 Join the conversation with her on Facebook, Instagram, Twitter, Pinterest and Tumblr. Today is awesome. I thought I lost these photos that I took but after some intensive computer searching, I found 8 sets of photos! One was this grey creme from the China Glaze "The Giver" limited edition collection called Five Rules. I haven't read the books so I'm not as excited about this collection as others but I was excited to take another chance with a grey creme. If you're a long time follower, you know I've been looking for my perfect grey forever. Is this it? I used a base coat of Cult Nails Get It On, 2 coats of polish, and finished with Glisten & Glow HK Girl. Formula was pretty fantastic - not chalky, not runny. I do love this grey but I feel like it has a hint of green to it. Not moss green, but maybe a swamp look? It's quite pretty and I know it would be great with stamping. I will definitely wear it again, but probably only on short nails like I have here. It's still not my holy grail grey but it's getting close! The Giver Collection is limited edition so if you find it, BUY IT. This is one of the few times that China Glaze will NOT be keeping these colors around due to the collaboration with the movie. China Glaze [Website] [Facebook] [Twitter] can be found online through several etailers, including my favorite Head2Toe Beauty, Sally's Beauty Supply as well as TransDesign. 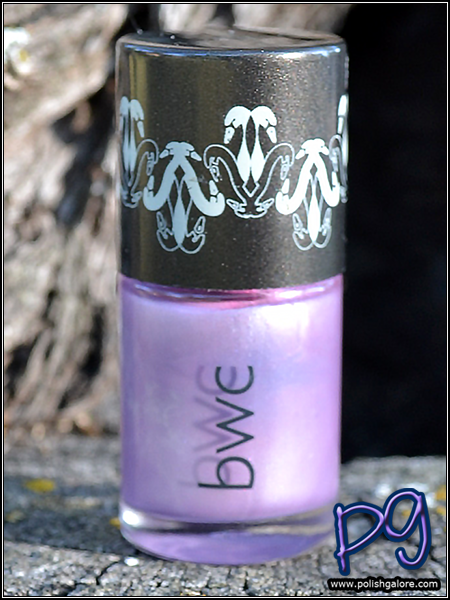 Beauty Without Cruelty (BWC) is a line of cosmetics founded in England in 1963 by BWC Charitable Trust, an animal welfare organization. Lotus Brands obtained the American rights to the BWC brand in 2010. Not only do they have nail polishes but also hair, skin and facial/body care products as well. The lacquer line called "Attitude Nail Color" contains no parabens, synthetic fragrance, PEG, toluene, formaldehyde, phthalates or gluten. It's vegan-vegetarian, available in 16 shades and states it's long lasting, fast drying and chip proof with one coat. Today I have Heather Mist, a light lavender polish with a pearl finish. I used a base coat of Cult Nails Get It On, 2 coats of polish and finished with Digital Nails Ain't Nobody Got Time For That. I preferred 2 coats for opaque coverage. 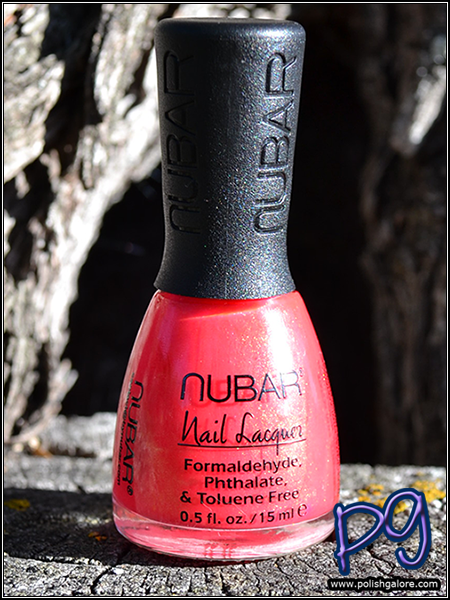 In the sun, you can see some of the imperfections on my nail so it might be better to use a ridge filling base coat if you purchase this polish. The color is pretty but the pearl finish is not my favorite. In the shade, the color appears darker but then again, so does my skin ^_^. The polish is opaque in these 2 coats without any VNL. Back in some indirect light, again just a pretty color but not really for me. This will probably end up in my charity pile of polishes that I send to Polished Girlz. 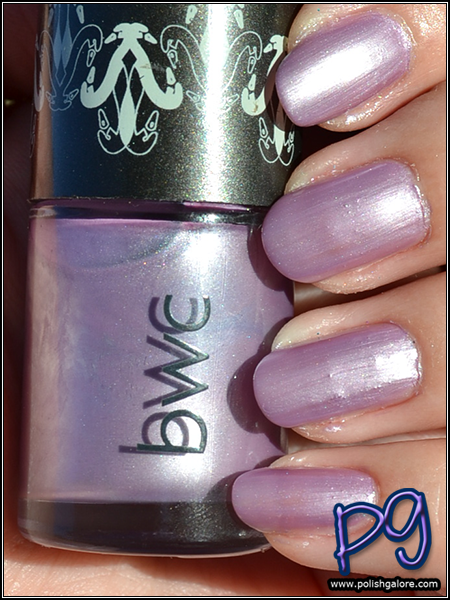 Beauty Without Cruelty Attitude Nail Color can be purchased on their website. Prices range from $17.50 to $17.95 for a 0.34 oz bottle. 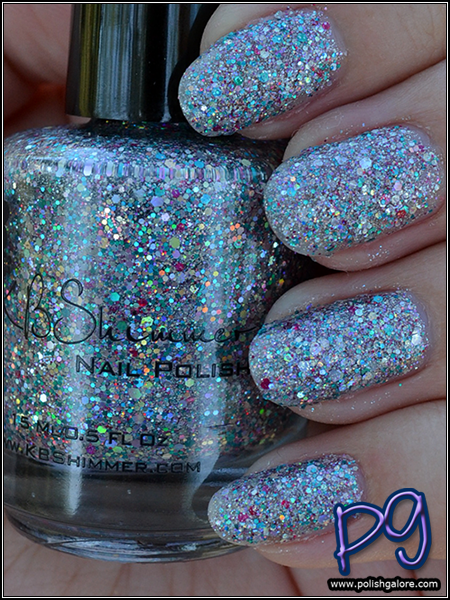 Earlier this year, KBShimmer celebrated their 6th Anniversary and for that special event, they released this beautiful holographic texture glitter polish called Hexy Bikini. It's pretty fantastic. The main colors to the eye are silver, teal and purple but there is just so much going on here. I used a base coat of piCture pOlish Revolution (a base coat that allows you to remove glitter polish like regular polish - it's not a peel off base coat), 2 coats of polish and finished with KBShimmer Clearly on Top because I prefer a smoother top with glitter. The brush was a little fluffy to aid in application. Look how amazing this is. I feel like everything is amazing right now - but seriously - LOOK AT THIS. The shine is fantastic, the purple and teal are a great combination of colors and then you have this great holographic silver base. Even in the shade, you can see how this color pops. I also had a little bit of a clean up issue because of fluffy brush that just make sure you clean your sidewalls with acetone and you won't have any problems. I was able to grab this photo with some indirect light coming in my living room. Just again, that beautiful rainbow holographic look in the bottle is just beautiful. Revolution did help in removal of this polish but if you don't own it and don't use a peelable base coat, glitter removal is like normal glitter removal so have patience and remove it properly so you don't damage your natural nail. 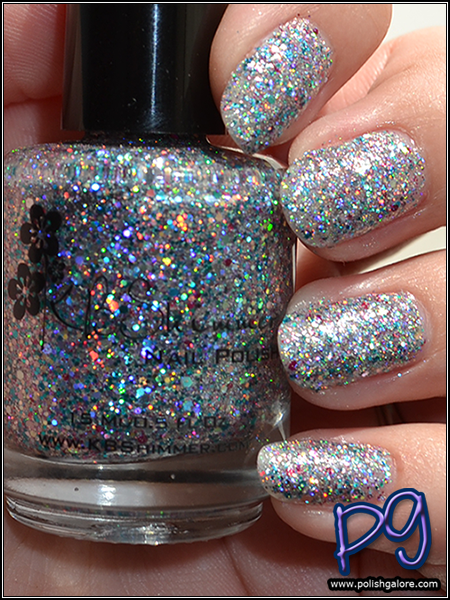 KBShimmer [website] can be purchased through their website for those in the United States and throughHarlow and Co for international sales. Prices range from $7.50 to $8.75. Connect with KBShimmer through their social media networks: Facebook, Twitter, Instagram and Pinterest. 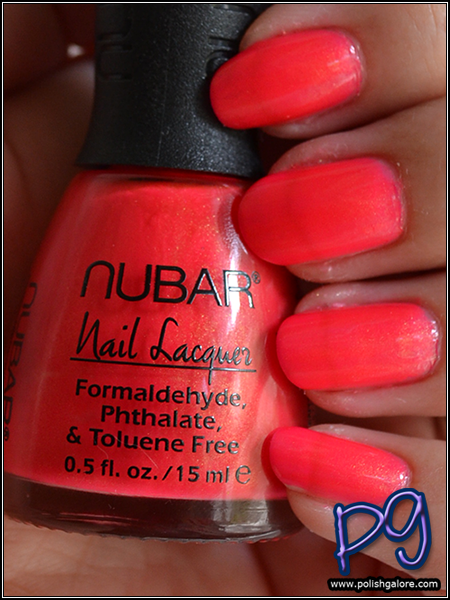 This fall, nubar came out with their FALLing In Love collection - 8 new colors made with mica to give it a shimmer. 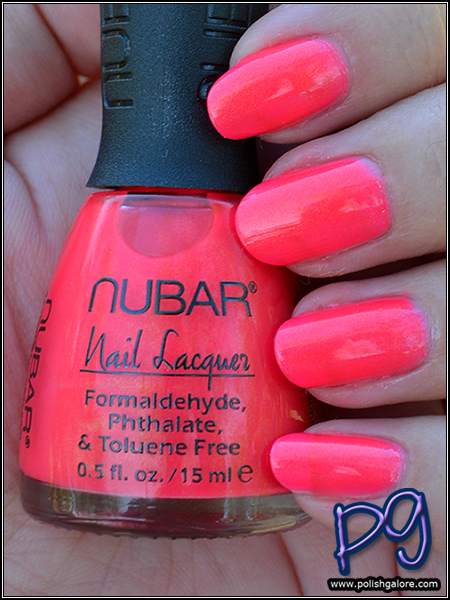 Sweet Hue is this fantastic melon pink, leaning neon almost, with a slight gold shimmer. I used a base coat of Cult Nails Get It On, 2 coats of polish and finished with Digital Nails Ain't Nobody Got Time For That. There was a little bit of VNL (visible nail line) after 2 coats but I didn't notice it until later. The sun was the only place I could really see the shimmer and even then it's a bit more pronounced in the bottle than on the nail. It reminded me of the China Glaze Strawberry Fields originally but not as much once I wore it. In the shade, this color was just ridiculously amazingly pretty. The shimmer is more of a reflective quality than a standout feature. Here in the indirect light, you can finally see that VNL that I was talking about. The shimmer is just a tiny bit more pronounced as well. It's my blog birthday! It's hard to believe that 5 years ago today, I opened my Blogger account and was like "Let's Do This." I'm very grateful for every single person who reads my blog and interacts with me online. 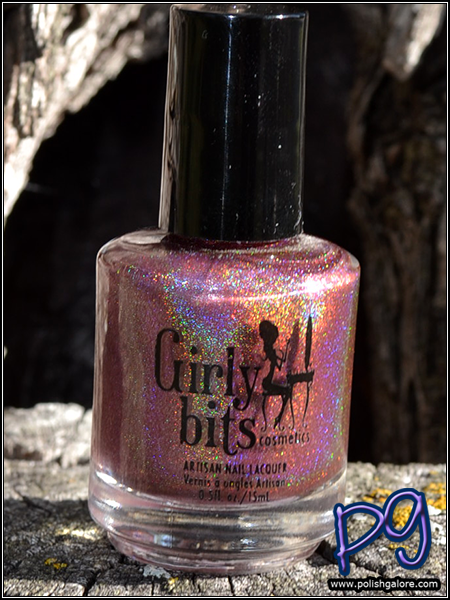 I thought I would celebrate with Girly Bits Auld Langs Wyne from the Holiday 2013 collection, a crazy holographic wine polish. I purchased this as part of the Gloss48 sale back in February of this year. I used a base coat of Cult Nails Get It On, 2 coats of polish and finished with Digital Nails Ain't Nobody Got Time For That top coat. The coverage was fantastic. My camera just couldn't handle this polish. It was so beautiful, so holographic, so BLING BLING BLING. I mean really, how awesome is this? Like most holos, it just kind of fades away in the shade but this base wine color is very pretty. Sneaking in some indirect sun. I really do love this polish. I was trying out a new rounded nail shape after seeing it everywhere - runways, fellow bloggers, magazine shoots... but I really do love my squoval nails so I'm back to those. Funny how things can change over the years! Girly Bits can be purchased on her website or through her approved distributors. Prices range from $10 (USD) to $12 (USD) but please note her website is in CAD, not USD because she is a Canadian company. Join the conversation on Facebook, Instagram, Google+, Twitter, & Pinterest. Elevation Polish is a new indie to me, but with over 500 indies in the market, that's to be expected. I was able to meet creator Lulu in Las Vegas earlier this year where she gave out this exclusive polish Yeti Finds An Oasis, a pale blue holographic polish that is perfectly opaque in 2 coats. I used a base coat of Cult Nails Get It On, 2 coats of polish and finished with Digital Nails Ain't Nobody Got Time For That. The sun is where this color really shines. The blue, the holo - a complete package. The Yeti Polishes are all limited edition polishes available from time to time. Because this one was a Cosmoprof Press exclusive, you may not be able to find it for sale anywhere. In the shade, the holo disappears (as most holos do) but you can still see this dusty cornflower blue polish which is quite pretty on its own. This was actually an accident - a photo with flash! 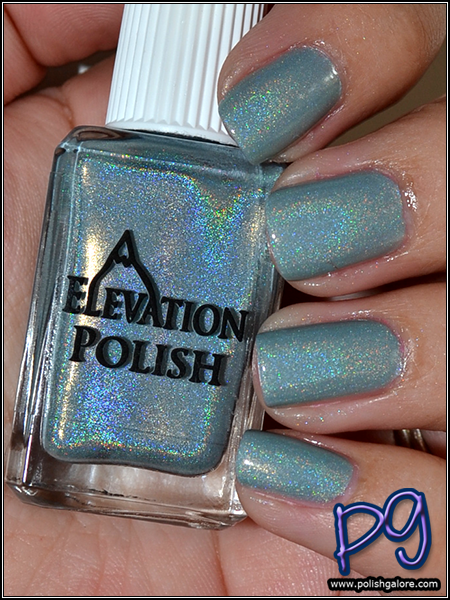 I was able to snag a few other Elevation Polishes that night which I hope to have on the blog soon. My polishes are undergoing a bit of a makeover in terms of storage. 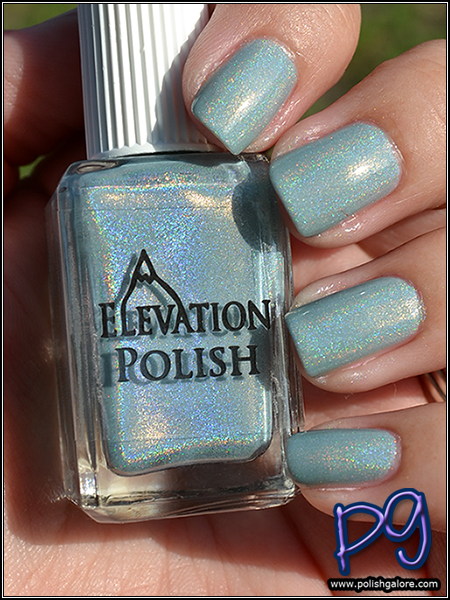 Elevation Polish is available on her website ranging in price from $8.50 to $11, as well as the stockist llarowe. She also offers custom polishes from time to time. You can also like on Facebook and follow on Instagram. If you live in California, then hopefully you're familiar with Beauty Collection - stores with a prestigious collection of hand-selected products from around the world. Nail wraps newcomer INNI even had a presence at Spring 2015 New York Fashion Week. Image courtesy of INNI. BUI was SO looking forward to deborah lippmann's shows - especially the one for Kate Spade! I'm not super fashion oriented but I've had my eye on several Kate Spade bags for awhile now. Please enjoy the recap of DL's shows - images courtesy of deborah lippmann. Continuing with my Spring 2015 coverage of New York Fashion Week was the always talented, CND! Images courtesy of CND. Now, some of you may remember that in September, I was on my way to my first ever New York Fashion Week but Baby Emery decided to pull out the stops and send me right back home before I even made it to NYC. I almost forgot to let you amazing readers know that I partnered with Jesse's Girl to have a FANTASTIC giveaway that includes an iPad Mini! You have until the 21st to enter, so DO IT NOW! Please note that all fulfillment is through Jesse's Girl and NOT PolishGalore. All terms and conditions are outlined in the Rafflecopter widget. LAUNCHES THEIR 2014 FALL COLLECTION. LVX nail lacquer announces the release of their tenth seasonal collection. Hello lovelies! Y'all know I have a soft spot for gloss48 - the niche beauty website that brings you some of the best in the beauty world! Starting today, ellagee is now on sale! I will be going more in depth with each polish over the next few days. From this set, I had both polishes but in transit, Friends On The Other Side decided to go to Polish Heaven. 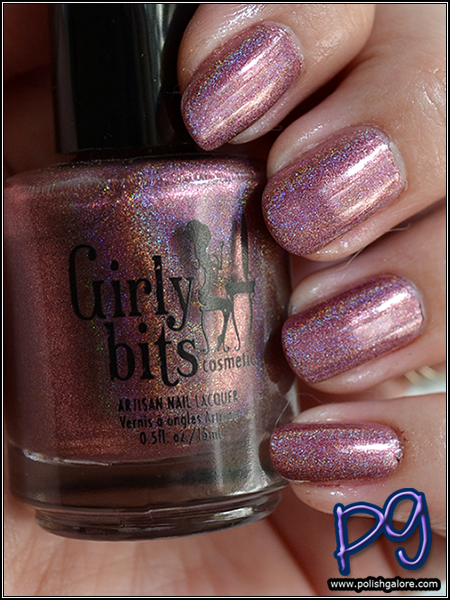 Meanwhile, check out this amazing purple holo that is Shake A Poor Sinner's Hand. The holo blue, Whoa, Is My Hair Out? works pretty fantastically with the clear top coat Let's Get Ready To RUMBLE, a mix of navy, indigo, and charcoal holo glitters. My last set that I received was the lime green holo Now Shall You Deal With ME!, paired with Mistress Of All Evil - a clear top coat with a mix of black, purple, and hot pink holo glitters. There you go! The duos are available for a special price but you'll have to go to gloss48 to check it out! Hurry though - the sale ends in less than a week! Nail'd It Coming to Oxygen! Unless you've been living under a rock, you heard the rumors that nail art was finally coming to TV! Earlier this year, Chalkboard Nails and JulieG posted behind the scenes photos of the show, the judges, and that fantastic set of nail polish walls. I have met and absolutely love both women, so it's been fun to see the journey! October is Breast Cancer Awareness month. Please enjoy the following wrap up of brands that will be participating in various breast cancer awareness events and efforts. With the most recent Zoya promo (50% off for having your Facebook profile linked to your Zoya account), I decided to pick up the 3 new Ultra Pixie Dust polishes. They aren't here yet, but I'm excited to try them out especially for this holiday season. FingerPaints Masquerade Affair is a LIMITED EDITION collection of rich and enchanting gold-infused hues. 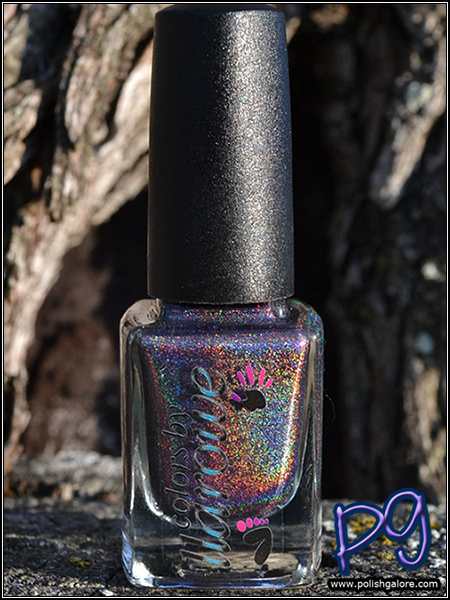 Today I have colors by llarowe At Last to share with you. I feel like the polish name describes me a lot right now because I feel like "At Last" some things are falling into place. Back in March, Mr. PG and I found out we were expecting a little girl. Sadly, in April, she was gone and I was filled with lots of sadness. We currently have a 7 year old and while we love him dearly, we were looking forward to expanding our family. Well, last month I found out that we are expecting again. I had quite a scare on my way to NYC for Fashion Week (official term was "threatened miscarriage") and while I'm not totally out of the woods yet, I did have some needed doctor's ordered bed rest to help my body try and reorient itself. Baby Emery is due May 2, 2015 and we are cautiously, happily awaiting his or her arrival. But back to the polish. 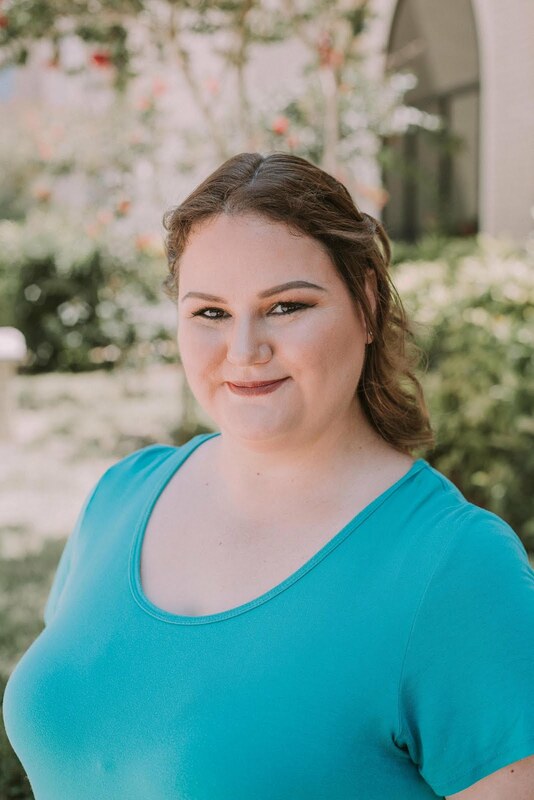 While at Cosmoprof North America, Leah Ann LaRowe, the owner of colors by llarowe gave out great gift bags with her newest collections - The Show Me Collection and Emily's Imagination. At Last is from Emily's Imagination and it's this crazy awesome purple blue teal multichrome holographic polish. I used a base coat of Cult Nails Get It On, 2 coats of polish and finished with Digital Nails Ain't Nobody Got Time For That. Top coat did not dull the polish at all. The first coat of polish was a little thin but the second coat made it nicely opaque. See what I mean in the sun? The purple comes out to play along with the holographic goodness. Meanwhile in the shade, you lose the holo but this lovely blue starts to peek out and give it this lovely duochrome look. Best part - no need to wear a base color under... again this is just 2 coats of polish! Finally inside with the flash, you can see the teal coming through strongly. It's a gorgeous color to wear and I can't wait to put it on again and play with some nail vinyls. Colors by Llarowe are available through the Llarowe website and range in price from $6 to $12. You can also like it on Facebook, follow on Pinterest, and follow on Instagram.